Looking out on Downtown LA as an airplane prepares to land at Los Angeles LAX. 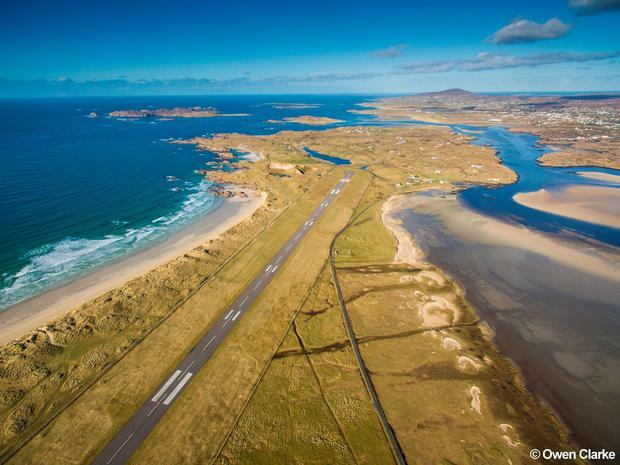 Donegal Airport has been voted one of the world's most beautiful approaches in a global poll of travel experts and fans. Malta International Airport topped the poll, conducted by private jet booking service PrivateFly, while Donegal placed seventh - ahead of far more famous approaches including London City, Los Angeles LAX and St. Maarten in the Caribbean. The poll saw thousands of people vote on a shortlist chosen by a panel of international travel experts, including ex-New York Times travel writer Joe Sharkey. Set between ocean and mountains at Carrickfinn, in the Gaeltacht region of Rosses/Gweedore, Donegal Airport operates twice daily flights to Dublin, and a four-times weekly service to Glasgow, both by Aer Lingus Regional. "You arrive in the Emerald Isle adjacent to one of the most beautiful beaches in the world; Carrickfinn with a backdrop of the majestic Mount Errigal on one side and an array of craggy islands on the other," gushed one travel fan. "We're over the moon and the team are delighted," said Pauline Sweeney, Marketing Manager with Donegal Airport, reacting to the news. "This will really create awareness for the airport and its location. It will highlight the county and the Wild Atlantic Way. It's all about awareness." The airport recorded 36.5k passengers in 2015, up 3.5pc on the previous year. “PrivateFly's poll has become an annual checklist for the well-travelled, and this year's voting was the most competitive yet," said Adam Twidell, CEO of the booking service and himself an experienced pilot. Previous winners of the annual poll include Queenstown (2015); Nice Cote D'Azur (2014); St Maarten (2013) and Barra in Scotland's Outer Hebrides (2012). "Approached from a churning blue sea, the tiny, isolated rocky island nation suddenly appears and you immediately understand Malta's strategic geo-political importance for literally millennia by sea and later air in the middle of the Mediterranean."